Australian & International Carrom Federations Approved GENUINE Championship Ball Design "Set of TWO" Carrom Board Strikers available only from Carrom Australia! This Genuine New Release Australian & International Approved Championship Ball design Carrom Board Striker is now available in various new colours. They all have beautiful & varying *colour designs, weighing 15 grams (for high performance and accuracy). 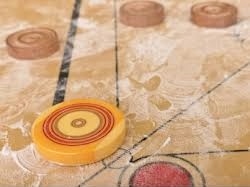 Manufactured as per strict specifications set down by both the International and Australian Carrom Federations. These strikers are available in various beautifully engraved designs, and presented in a plastic case for safe storage. A must for all Carrom Players requiring a precision striker for local, national or international competition play. When ONLY the Very Best will do! NB: *Colours & Designs Shown are Subject to availability.